In Antiquities 8, he describes the Temple as it was built by Solomon. In War 5 Josephus describes the Temple within the context of the description of Jerusalem on the eve of the Roman conquest. Descriptions of the Jerusalem Temple in Josephus and the Temple Scroll by Lawrence H. Schiffman - This discussion will read Josephus independent of mishnaic material, and will, in turn, compare Josephus’ descriptions to those found in the Temple Scroll. Tradition holds that the two previous temples of Solomon and Herod were situated over the Dome of the Rock. There have also been theories that the temple was just to the North or just to the South of the Dome of the Rock on the Temple Mount. Recently, with what seems to go back to the writings of Ernest L. Martin in 1994, there has been a lot of theories and beliefs that the temple may not have been on the Temple Mount, but rather to the South of the Temple Mount in the City of David. This page will look at the arguments for both sides with references for further personal reasearch. This page is focused more on the spacial aspect of the temple. For the history of the temple, go here. The first place to start is simply to examine quotes from Biblical and historical first hand accounts. From the Bible we don't get much of a description of the details of the location, but we do know some facts about its location. The people sacrificed and burned incense still in the high places. Jotham the son of Uzziah built the higher gate of the house of the LORD. (2 Kings 15:35 | 2 Chronicles 27:3-4 | 1 Kings 3:2-4) This would seem to indicate there was a higher place than the temple that people were sacrificing at and so a gate was built at the temple leading to that higher place. From scripture we can gather that the temple was opposite the Mount of Olives on Mount Moriah where the threshingfloor was within the walls of Jerusalem at the time of Solomon. This could be either in the city of David or on the Temple Mount. As described in 1 Kings 3:2-4, prior to the temple being built, “the people sacrificed in high places, because there was no house built unto the name of the LORD.” Then both 2 Kings 15:35 and 2 Chronicles 27:3-4 speak of Jotham, the son of Uzziah, building a higher gate of the house of the LORD because the people were still sacrificing and burning incense in the high places. This would seem to imply that the temple, which was on Mount Moriah, had points higher to it upon which people were sacrificing such that a gate was built on to that higher side. The middle of the temple was visible to those that dwelt in the country for a great many furlongs. He also built a wall below, beginning at the bottom, which was encompassed by a deep valley; and at the south side he laid rocks together, and bound them one to another with lead, and included some of the inner parts, till it proceeded to a great height, and till both the largeness of the square edifice and its altitude were immense, and till the vastness of the stones in the front were plainly visible on the outside, yet so that the inward parts were fastened together with iron, and preserved the joints immovable for all future times. When this work [for the foundation] was done in this manner, and joined together as part of the hill itself to the very top of it, he wrought it all into one outward surface, and filled up the hollow places which were about the wall, and made it a level on the external upper surface, and a smooth level also. This hill was walled all round, and in compass four furlongs, [the distance of] each angle containing in length a furlong: but within this wall, and on the very top of all, there ran another wall of stone also, having, on the east quarter, a double cloister, of the same length with the wall; in the midst of which was the temple itself. On the north side [of the temple] was built a citadel, whose walls were square, and strong, and of extraordinary firmness. Herod fortified the tower, in order to secure and guard the temple. To honor his friend and Roman ruler Antonius, he named it the Tower of Antonia. the last led to the other city, where the road descended down into the valley by a great number of steps, and thence up again by the ascent for the city lay over against the temple in the manner of a theater, and was encompassed with a deep valley along the entire south quarter. This cloister had 162 pillars that stood in four rows with the fourth row interwoven into the wall. Each pillar was the diameter of three men joining hands around it. They were twenty-seven feet long (tall), with a double spiral at their base. These four rows of pillars created three walkways in the middle of this cloister, two the same size with a breadth of thirty feet, the length was a furlong, and the height fifty feet. The breadth of the middle walkway of the cloister was one and a half times those on either side, and the height was double. The roofs were adorned with deep sculptures in wood, representing many sorts of figures. The middle was much higher than the rest, and the wall of the front was adorned with beams, resting upon pillars, that were interwoven into it, and that front was all of polished stone. In the midst of this cloister was the second, to be gone up to by a few steps: this was encompassed by a stone wall for a partition, with an inscription, which forbade any foreigner to go in under pain of death. Now this inner enclosure had on its southern and northern quarters three gates [equally] distant one from another; but on the east quarter, towards the sun-rising, there was one large gate, through which such as were pure came in, together with their wives; but the temple further inward in that gate was not allowed to the women; but still more inward was there a third [court of the] temple, whereinto it was not lawful for any but the priests alone to enter. The temple itself was within this; and before that temple was the altar, upon which we offer our sacrifices and burnt-offerings to God. Into none of these three did king Herod enter, for he was forbidden, because he was not a priest. However, he took care of the cloisters and the outer enclosures, and these he built in eight years. The temple was built by the priests in a year and six months. The celebration of its rebuilding coincided with the king's inauguration and so the celebration was great. There was a passage built for the king that led from Antonia to the inner temple, at its eastern gate. Over this he also erected a tower for himself so he could get into the temple to guard against any sedition made by the people against their kings. The traditional view of somewhere on the Temple Mount being the location of the Jewish temples in Jerusalem has been widely accepted in its various forms, but primarily the traditional location for the original Jewish temples has been at the Dome of the Rock site. “It was in this time of the Crusades (about 1165 C.E. ), that a Jewish merchant by the name of Benjamin of Tudela made a visit to Jerusalem. He was not a historian or theologian. He simply reported in a chronicle of his journey what he saw and what he was told without criticism. He is noted for some absurd geographical identifications of former biblical spots. Be that as it may, when he heard the Christian and Muslim accounts that the Haram esh-Sharif was the location of the former Temples, the Jewish merchant accepted their explanation (for the first time by any Jewish person). Benjamin did so without expressing the slightest historical criticism to justify such identifications. “There was an overpowering reason for this. Benjamin of Tudela was enthralled over a supposed discovery of the tombs of the Kings of Judah (those of King David and Solomon and others). He was told that the tombs of the Judean kings were supposed to have been found on the southwest hill about 15 years before he arrived in Jerusalem. Benjamin did not see the "Tombs," nor has anyone else since that time. But this hearsay "story" so impressed Benjamin (and later Jews after the time of the Crusades) that the Jewish authorities very quickly began to accept the southwest hill as being the original "Mount Zion" of the Holy Scriptures (and that Zion was not located on the southeast ridge). 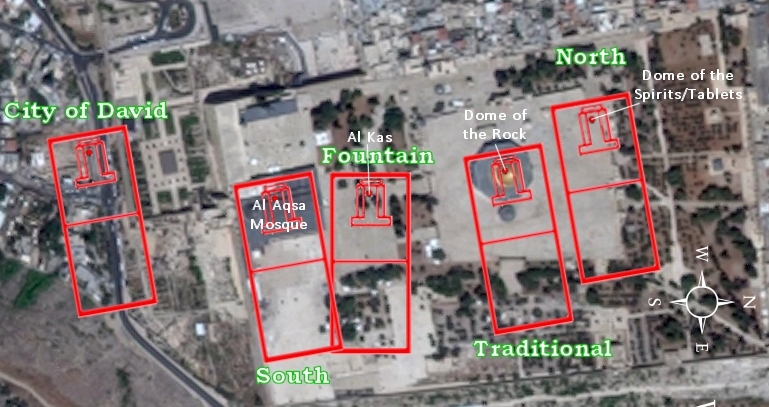 This false acceptance led them also to give credence that the Haram esh-Sharif area might possibly be the Temple Mount (after all, with this new "archaeological discovery" on the southwest hill — and they did not question its legitimacy — it meant to them that "Mount Zion" had now been found on the southwest hill and that it was no longer believed to be over the Gihon Spring in the Kidron Valley). This was counter to all Jewish belief before the Crusader period. Because of this, even the location of the Gihon Spring was changed to be in the upper western extension of the Valley of Hinnom — at least 2000 feet west of where the spring actually was located.